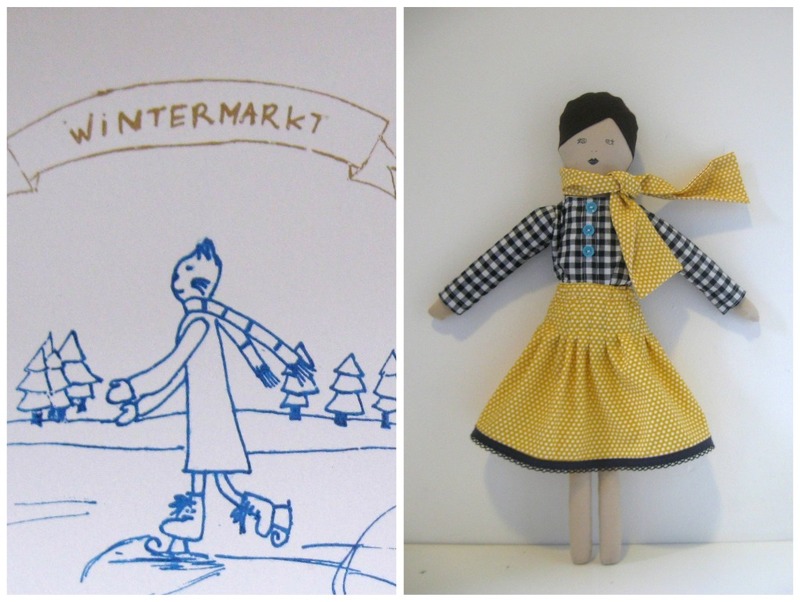 Yesterday I asked Sofia to design a invitation for our wintermarket and here it is, a cute cat ice-skating (why didn't I think about that?). We took the drawing of Sofia and traced it with a special gocco pen and then gocco-printed the invitation in blue & gold. I was also quite productive yesterday evening and managed to sew a new outfit for one of the dolls, pretty chic I would say! If you like the custom dolls that I have been posting lately, you can buy them at the wintermarket (and will not be for sale yet in my etsy shop) or just contact me and I make a special order! The girls and their friends would like to welcome you in their Roulotte Cafe for hot chocolate and fresh cookies, inside we will have a wide selection of handmade goodies great for your Sinterklaas and Christmas shopping. Children always come up with the best ideas! Lovely invitation...and I love all your dolls. I'm very much enjoying your blog too. Have a nice day. Just want to say thank you for my rabbit, I'm very happy with the finished outcome, some photos over here. That is a lovely card... and doll! Me again this was my first stop and your dolls are amazing!!! leuk om jullie dan weer eens te zien, tot dan! oh en de kindjes zullen de Roulotte Cafe ook geweldig vinden!